We’d love your help. Let us know what’s wrong with this preview of Maddy's Wings by Jan Porter. Maddy’s Wings is a heartwarming life tale of 92-year-old Maddy, a WW2 Air Auxiliary pilot. Diagnosed with Alzheimer's she is challenged to face painful memories of crashing a loaded B26 bomber that killed two female flight crew members. 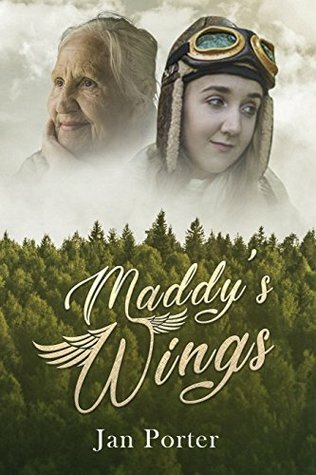 Heart break and humour abounds, as she recalls growing up in the tiny northern Ontario community of Cedar Grove during the depression and a Maddy’s Wings is a heartwarming life tale of 92-year-old Maddy, a WW2 Air Auxiliary pilot. Diagnosed with Alzheimer's she is challenged to face painful memories of crashing a loaded B26 bomber that killed two female flight crew members. Heart break and humour abounds, as she recalls growing up in the tiny northern Ontario community of Cedar Grove during the depression and adventurous crop dusting Jack trains Maddy to fly. After the crash and war, home settling with navy man Gordon, they are challenged to overcome war traumas while facing the death of their daughter and unborn granddaughter. Stoically facing the of end of her life, aging Maddy befriends a stuttering old woman as her estranged son-in-law returns from assignment in Afghanistan. New neighbours; a woman and her teenaged granddaughter offer womanly bonding, pet pig companionship and medicinal giggle brownies. As Maddy begins to live old age to its fullest, a ruthless elder care worker taunts her. As though surviving a plane crash, the atrocities of war is not enough and death of loved ones, once every eighty-eight years, all hell shakes loose. Truth and insights collide, as mysteries surface: Who killed the wolf in sheep’s clothing Pastor Jacob? What really caused the fateful plane crash and why was Gertie out of her seat? Why had she survived while so many had not? What really happened to little sister Rosie during and after the war? Maddy’s soul longs only to freely soar and live her last days having a blast, yet as her memory slips, she is confronted with one last nemesis; survivor guilt. Maddy may re-define what it means to be a hero. To ask other readers questions about Maddy's Wings, please sign up. An Arc copy. For readers of historical fiction, a heartfelt story of elderly telling their stories and dealing with long ago mistakes. Porter also gives us as readers glimpses of the time periods that puts today's society in perspective. Highly recommend to historical fiction readers. This was just an okay book. It could have been really good, but it was a little wonky. The ending was really sudden and left me feeling unfulfilled. The background story of Maddy and her time as an RAF pilot was interesting. And her relationships with those from her past and the present were interesting. Maddy was a quirky lady and had a great sense of humor. There were moments when I was chuckling. The home health investigator was an absolute jerk and I was praying she would get her "just dues." T This was just an okay book. It could have been really good, but it was a little wonky. The ending was really sudden and left me feeling unfulfilled. Maddy's Wings has a great synopsis. It sounds like it is going to be a tale of redemption and historical fiction. But the book itself is very poorly written. It took me a very long time to read this, as it is FULL of spelling and grammatical mistakes. The scenes change very quickly in a way that is confusing, and the dialogue is clunky. I would not recommend this book to anyone. Outstanding Historical novel about a very thoughtful and lovely elder lady named Maddie,who is definitely the star of this book. She and other gals like her flew planes loaded with bombs,during WWII,but failed to get the recognition that was accorded to the men. She agonized her whole life about a plane that got hit by enemy fire that she was piloting and crashed into the ocean,killing all aboard except her. She married,had one daughter and lost her in childbirth at an early age.Later in life she m Outstanding Historical novel about a very thoughtful and lovely elder lady named Maddie,who is definitely the star of this book. She married,had one daughter and lost her in childbirth at an early age.Later in life she meets up.with her ex son-in-law,again after 40 years,who had never re married. The story goes back and forth,somewhat between earlier yrs and current ones,but it's all good. would recommend to all.who love a good Historical novel..
-Soul Skin, Woman, have you had enough?